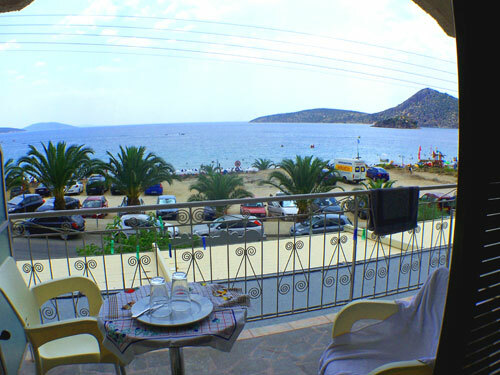 The apartment block offers apartments with sea views or apartments in the semi basement for lovers of peace and quiet. All the apartments have air-con, fridges and television. 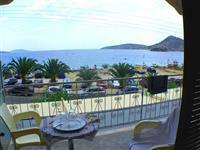 At the front of the building is a taverna cooking tasty meals which overlooks the beach across the beach road. There is ample parking at the side of the apartments. Water-sports are available at Tolo. Please ask at reception. Tolo is half working town and half a tourist town and is popular with locals, Greeks from far and wide and visitors from overseas. The sea is shallow and warm in the summer and is mostly sandy. The view over the bay is of the mainland and little islands giving it a tropical feel during the hazy heat of the summer. Tolo has everything you need for a summer holiday by the sea and provides facilities for water sports, an array of tavernas and cafes and plenty of supermarkets for those who wish to self cater. A short distance from Tolo only 12km away, is the first capital of modern Greece, Nafplio. Nafplio is one of the most historic and beautifull towns in Greece. Visiting Nafplio you must see the Palamidi castle,the Bourtzi,the archaelogical museum, the folk museum and the war museum. 2. Argos, Europes most ancient town.